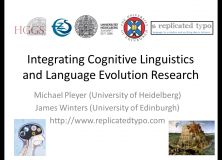 Today James and I are giving a talk at the Poznań Linguistic Meeting (PLM) on “Integrating Cognitive Linguistics and Language Evolution Research.” It’s a talk in a thematic section on “Theory and evidence in language evolution research”, which I hope to blog about a bit tomorrow. On the ontogenetic level, cognitive-functional and usage-based linguistic approaches investigate the importance of social, cultural, interactive and cognitive processes in language acquisition and learning (Beckner et al., 2009). In particular, they have demonstrated the crucial role that capacities and motivations for perspective-taking, shared intentionality, joint attention, as well as cognitive processes like analogy, statistical learning, generalization and entrenchment play in successfully acquiring and learning to use a language (e.g. Tomasello, 2003, 2008). Through the repeated interaction between individuals we can observe regular patterns of change at the glossogenetic level. So, rather than simply appealing to historical contingency, diachronic language change is also dependent on biases and constraints that, through a continual cycle of innovation, amplification and fixation (Croft, 2000), are expressed as system-wide characteristics (Deacon, 2010: 124). Still, these are far from pre-determined paths, with the trajectories of change being much more similar than the resulting states (Beckner et al., 2009: 7). Such is the case in the well-attested process known as grammaticalization: “[a] subset of linguistic changes whereby lexical material in highly constrained pragmatic and morphosyntactic contexts becomes grammatical, and grammatical material becomes more grammatical […]” (Traugott, 1996: 183). Grammaticalization might therefore be considered a canalizing process: that is, it limits the search space in which variation is allowed to explore. Importantly, these Cognitive-Linguistic elucidations of the cognitive processes involved in and necessary for language acquisition, transmission and change can also inform accounts of the phylogenetic evolution of language. Namely, they can do so by helping to specify the cognitive and representational capacities that had to evolve beyond those found in other animals in order to support language and the interactive and dynamic processes of meaning construction fundamental to linguistic interaction. It is clear these general cognitive mechanisms influence language change. Yet the extent to which they have shaped the evolution of language is something that is currently under explored. Kirby (in press), for instance, posited that the grammaticalization process might offer an explanation for the division of labour between contentive and functional items in the lexicon (Kirby, in press: 13). As Cognitive Linguistics sees the complex adaptive system (Beckner et al., 2009; Winters, Tissari & Allan, 2010) of language as well as its evolution as relying on general cognitive capacities and factors, it also actively seeks to integrate converging evidence from other disciplines in cognitive science (Evans 2012). This feature of Cognitive Linguistics thus makes the discipline highly amenable to interdisciplinary integration and presents another reason why a synergetic dialogue between Cognitive Linguistics and language evolution research seems worthwhile. A crucial question, then, concerns the relative roles of cultural evolution and biological evolution in accounting for the underlying structural hallmarks of language. By showing how general cognitive capacities can interact with cultural evolutionary processes, we might be able to extrapolate from well-attested processes observed in historical language change to the evolution of language. Thus, in focusing on the role of general cognitive capacities and constraints from the conceptual system, pragmatics, learning and processing mechanisms, perceptuo-motor and other factors in determining language structure and usage (Christiansen & Chater, 2008), Cognitive Linguistics can make a significant contribution to the highly interdisciplinary study of language evolution. In our talk, we will present case studies from the three timescales discussed above in order to illustrate that a further integration of Cognitive Linguistics and language evolution in the future indeed promises to be a highly fruitful enterprise. For instance, we will focus on the Cognitive-Linguistic notion of construal, which denotes the fact that language can be conceived of as a structured inventory of constructions which enable language users to encode a situation in many different ways and from multiple perspectives (Evans 2012; Pleyer 2012). This facility plays a central role in language use and acquisition and can also be shown to be highly important in explicating the complex adaptive system of language on the ontogenetic, glossogenetic, and phylogenetic level. Beckner, C. et al. (2009). “Language is a complex adaptive system.” Language Learning, 59(s1): 1-26. Christiansen, M. H. & Chater, N. (2008). “Language as Shaped by the Brain” In: Behavioral and Brain Sciences 31: 489-509. Deacon, T. (2010). “Emergence: The Hole at the Wheel’s Hub.” In: Clayton, P. and Davies, P. (eds.). The Re-emergence of Emergence: The Emergentist Hypothesis from Science to Religion. Oxford: Oxford University Press: 111-150. Evans, V. (2012). “Cognitive Linguistics.” In: Wiley Interdisciplinary Reviews Cognitive Science 3: 129-141. Kirby, S. (2012): “Language is an Adaptive System: The Role of Cultural Evolution in the Origins of Structure.” In: M. Tallerman & K. R. Gibson (eds): The Oxford Handbook of Language Evolution. Oxford: Oxford University Press, 589-604. Kirby. S. (in press). “The Evolution of Linguistic Replicators.” In: Smith, K. and Binder, P. (eds). The Language Phenomenon. Springer. Pleyer, M. (2012). “Cognitive Construal, Mental Spaces and the Evolution of Language and Cognition.” In: T. C. Scott-Phillips, M. Tamariz, E. A. Cartmill und J. R. Hurford (eds. ): The Evolution of Language. Proceedings of the 9th Conference on the Evolution of Language. Singapore: World Scientific, 288-295. Sinha C. (2009). “Language as a biocultural niche and social institution.” In: New Directions in Cognitive Linguistics. Amsterdam: John Benjamins; 2009, 289–310. Tomasello, M. (2008). The Origins of Human Communication. Cambridge, MA; London, England: MIT Press. Winters, M.E., Tissari, H. & Allan, K. (2010). Historical Cognitive Linguistics. Mouton de Gruyter: Berlin. Next Next post: Jim Hurford: What is wrong, and what is right, about current theories of language, in the light of evolution?